High-definition surveying (HDS), or “laser scanning,” is a new method used by integrated design-build firms to capture a highly detailed 3D image of a construction project. Instead of using cameras to capture this virtual image, lasers (which are much more accurate) are employed. Companies such as Faro and Leica Geosystems have created sophisticated laser scanning devices that allow contractors to quickly extract 3D data from a structure. This can then be used for a multitude of things such as data analysis, creating a renovation model, comparison to as-designed models or drawings for quality assurance, creating a record of what is behind the walls, and much more. Typically the design-build industry is not one in which shortcuts are readily embraced. The benefits an integrated design-build model produces takes a full investment in each step of the process, from initial concept through a completed project. As a result, the architecture, engineering, and construction industry has been a relatively slow adopter of new technologies. This is slowly changing as you see firms adopting Building Information Modeling (BIM), drones, and GPS technologies. Laser scanning increases efficiency, provides a quicker turnaround on projects while reducing labor costs, and allows contractors to add greater value all the way to construction completion. It’s estimated that laser scanning can reduce onsite data collection time by 50-70% when compared to traditional methods. Also, a cost/benefit analysis shows that the cost to adopt laser scanning can be realized in as few as 15-20 projects. However when it comes to laser scanning, it’s a shortcut which should be, and has been, embraced in construction-related build-outs. This relatively new technology is growing across the engineering field. It’s largely driven by the time-saving and cost-cutting benefits it provides. 3D laser scanning is an advanced technology that captures the shapes of physical objects digitally using a laser light. The laser scanner captures very specific details, as well as shapes and forms, with precision accuracy. The scanned data can then be converted digitally to three-dimensional products such as fully textured models, plans, and elevations. Unlike methods that only capture individual points one at a time, a 3D laser scanner captures rich detail of an entire building or construction scene. Essentially, think of laser scanning like a camera taking a 360 degree photo but with an accurate position for every pixel. The laser scanner is placed at the construction site or within a building. The data points are captured using a mounted scanner, much like how a traditional surveyor works. The field data is then digitally converted via special software to complete the desired imagery. This all contributes to engineering firms completing projects with more speed and accuracy than with other traditional methods. How is 3D Laser Scanning Used in Engineering and Building Applications? 3D scanning is especially beneficial for those involved in renovations, large construction projects, additions, or the repurposing of structures. Some of the real-world applications utilizing laser scanning are comprehensive plans and elevations, panoramic images of site and building locations for integrated design-build projects, fully textured models, and BIM. When working on a renovation or redevelopment project, up-to-date construction or maintenance documents are hard to come by. If a contractor uses a laser scanning device, they are able to capture a completely accurate picture for these projects, essentially creating their own construction “documents” with the press of a button. The data that the scanner generates is uploaded to building information modeling (BIM) software, which allows the contractor to effortlessly continue with the construction planning processes. Consider historical building revitalizations, for example, where abandoned historical buildings are renovated into usable space within a community. VIP Structures has experience in this area, and an important piece of this type of project is restoring a building to its original façade and interior features. Safe to say, the precise accuracy of laser scanning would be effective here. Here’s a spotlight on a historical rebuild project in downtown Syracuse. One key feature of a 3D laser scanner is the ability to take panoramic photos of project sites. If a site to be scanned is especially large or complex, multiple scans of that site from different vantage points can be registered together digitally to provide one inclusive view for the engineer. This is especially helpful with large construction sites such as buildings with complex geometry, parking garages, building elevations, multifaceted site plans, and commercial projects. Here are 5 core benefits to using the technology in the engineering field. Benefit 1: Improve accuracy and efficiency – Quite simply, laser scanning can provide more precise as-built drawings than any other method. With laser scanning, an as-built drawing will show the exact locations of mechanical, structural, and plumbing features of any building. It also produces various views and cross-sections of a floor plan for remarkably accurate drawings. The technology is especially helpful in restoring historic buildings where site and building plans are likely no longer available. As an integrated design-build firm and space consultant, the 3D laser scanner can provide us foresight that no other technology can provide. Laser scanning can also improve contractors’ efficiency by lowering the amount of rework that needs to be done. Rework is defined as work measures that have to be completed more than once, or work that needs to be redone unnecessarily because of unforeseen issues. Rework in construction projects can significantly increase project cost and alter a project’s schedule. Laser scanning exposes errors early in the process. It can aid in a contractor’s capacity to catch conflicts before they occur, which reduces the amount of rework that needs to be done. This real-time quality assurance translates into hundreds of thousands of dollars in savings on some projects. Benefit 2: Reduced costs in engineering and construction projects – Laser scanning creates much more comprehensive documents to review off-site. This dramatically reduces the need for follow-up visits to sites to review spacing and visuals. It saves on cost so engineers can work more efficiently without worrying about duplication or repeat measures. Therefore, the work is done right the first time, saving time and material costs. Engineers can access the scanned data before going to the modeling stage in order to make initial assessments and fundamental calculations of a site build-out. Benefit 3: Reduce risk and increase safety on project sites – An often overlooked benefit of comprehensive 3D laser scanning documents is that engineers can identify vulnerable and unsafe areas easily, reducing the amount of on-site accidents and injuries. This is especially helpful in the restoration of historic buildings, where areas of decay and deterioration are readily identified via a 3D laser scan. In addition, engineers and clients are put at less risk because their time on-site is reduced by virtue of fewer visits. A side benefit of this, beyond safety, is it also limits interruptions in the construction schedule when the manager(s) or owner(s) visit. Benefit 4: Post laser scan software – The analyzation of these large datasets gathered from laser scanning has vastly improved. Post laser scan software is a useful tool that allows engineers to analyze actual scan data, enabling them to take laser scanning results further and complete project tasks faster and more accurately. Here’s an example of how a laser scan was used to quickly inform engineers on how to renovate a concrete floor, easily showing them areas to cut and fill to ensure safety. Another example shows how software can be used to help an integrated design-build team find construction mistakes before they become costly. This software enables engineers to check an entire project for errors in the same time it would take the staff to spot check. This is helpful for owners after construction is completed and during maintenance of the building. By using laser scanning, owners can quickly reference these documents to see exactly where all of the building’s elements are located and when they were put into place. Keeping the owner’s perspective in mind during an integrated design-build project is crucial to creating an effective space. For some contractors, laser scanning can pose a barrier because of initial costs – the device, software, and operations training can quickly add up. However, for those firms who have invested in this powerful technology, the payback period can be quick depending on how soon the scanner is put to use on a project. A simple 30 minutes of scan time in the field and 30 minutes of post-processing can save a contractor roughly $30,000. One explanation for the massive savings is due to the fact that only one person is needed to go out and scan most projects, which reduces labor costs. Laser scanning can also be used to analyze and calculate precise amounts of material needed. The sustainability perk that comes with using laser scanning is that its use leads to exact material orders and thus less waste and more cost savings. Learn more about the importance of sustainable building. The art of laser scanning is now being applied to new construction projects, as well as to aid in the BIM process. 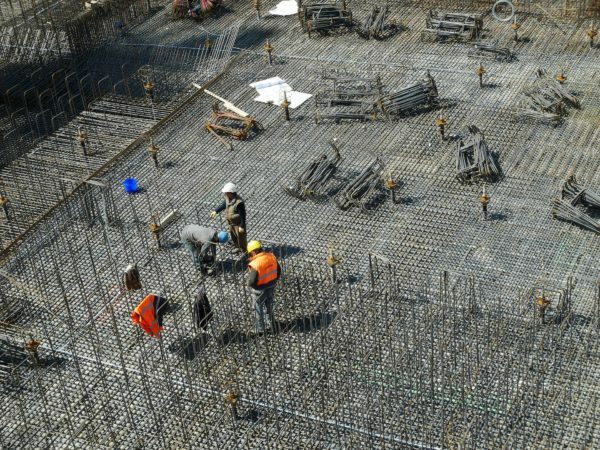 If a contractor scans all building components in real-time as they are installed, a record of data can be compiled with striking accuracy on the structural elements, HVAC, pipes, and rebar throughout the building. This is used as a helpful reference guide as the data can be compared to the actual design to ensure that everything was properly installed. Also, artificial intelligence (AI) and drones are new tools with laser scanning capabilities being used for data collection for construction productivity. These robots and drones are equipped with laser scanners to measure progress and quality at the worksite. Using AI to automate data collection saves time by removing the need for workers to physically be on site to run laser scans. The use of drones saves time by more easily measuring the productivity and quality of a worksite from a bird’s eye view. Although 3D laser scanning itself is a new technology adopted by some of the market leaders, many are beginning to understand the benefits of speed, accuracy, and comprehensiveness that it offers. Further benefits of 3D laser scanning will continue to emerge as the technology becomes mainstream among engineering firms across the country. Whenever possible, developers and building owners should be on the lookout for contractors who use laser scanning devices. In fact, IPD Engineering now owns a 3D laser scanner and offers its use as a service. When you boil it down in the end, embracing 3D data collection at this scale for integrated design-build projects makes sense when you think about the future of building construction. BIM and big data will continue to proliferate, soon encompassing the entire architecture, engineering, and construction industries due to its efficiencies. So why not have your next project virtually mapped by millions of accurate data points for future reference? Interested in learning more about 3D laser scanning and how IPD Engineering can assist with your next development project? IPD works closely with VIP Structures to create fully integrated design-build projects for our clients. Browse our blog for more information or contact us below. Credit to Bill Fletcher, BIM Manager at IPD Engineering for his thoughts on this blog post.